As per Government of India, the states of North East region had problems of armed revolts and insurgencies and due to this, the Government had declared them as “Disturbed Areas” (though it is also true that there is no clear definition or virtue to declare an area disturbed), and the centre-governed security forces were deployed to these states with some special powers. AFSPA (Armed Forces Special Power Act) is one such rule that has been imposed in the North Eaststates and the state of Jammu and Kashmir. It simply means that government allowed to send its army in civil areas of NE states and J&K with some special powers. AFSPA came into existence in 1958. As per the section 4 of AFSPA, even a non-commissioned officer is authorized to shoot, merely on the basis of suspicion and no criminal inquiry can be filed against him without prior permission of central government. Not even that, it also includes authority to arrest without warrant, to seize property or to search any premises including breaking the safety locks. After 1958, AFSPA was extended to J&K in the year 1990. Till that date, AFSPA has become cause of severe human rights violations in these states. According to activists and human rights organisations, the law has proved to draconian. It is a martial law in terms of the extraordinary power that it provides to a soldier in a civil area. This is surprising as the Section 3 of AFSPA states ‘In the aid of civil power’ which reflects the objective of assisting the civil authorities and not to ‘control’ or ‘overcome’ them. It is a matter of fact that in most of the cases, it didn’t happen and AFSPA almost overcame the civil authorities, rather than being an aid to civil power. In doing so, it has also caused huge loss to people and property and their trust in the statue of ‘democracy’. We also have many examples wherein the security personals didn’t permit the civil authorities to interfere even when there was proof of violation of human rights. In the recent case of Ramban (J&K) where BSF fired upon local residents and it claimed 4 lives, on the next day, Superintendent of police himself told that he saved his own life from bullet somehow as BSF fired suddently. This statement was a front page newsline of a mainstream Indian newspaper and it clearly depicts the ‘sidelined’ condition of local administration at many times. It is well known fact that even civil authorities sometimes felt themselves helpless, protested officially over the way of working of security personals and their non supportive and non coordinating attitude. It is not a wonder as there are many loopholes in AFSPA that provide benefit to security to-do so. 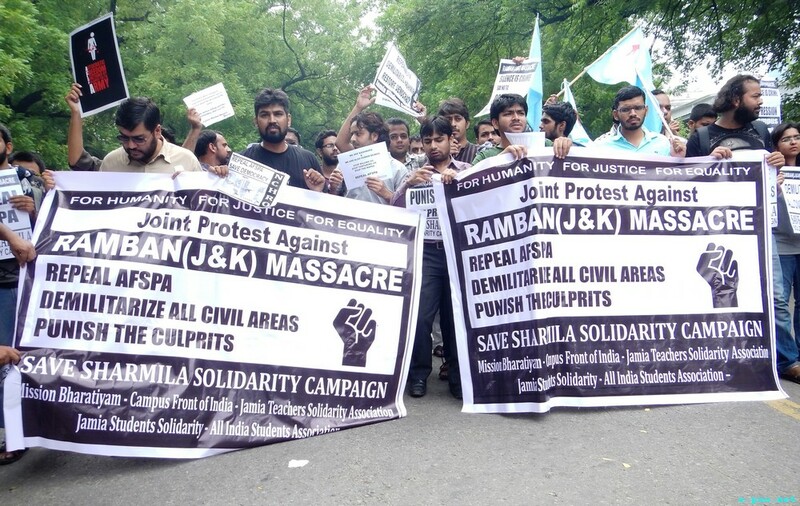 Impunity is the very first loophole in AFSPA where permission of central government is required to register any criminal case against any person who is shielded under AFSPA. Till now, even in last two-three decades, there is not a single example of the permission granted by central government. In case of arrest without warrant, the provision is to produce the arrested person before the judicial magistrate but the maximum time is not defined under this provision. People have been kidnapped by security personals and till today many of them are disappeared, some of them got killed in fake encounter, some of them produced after years. Not only the civil authorities but the judiciary has also became helpless before this law. The reputed post of registrar of the high court of Guwahati who went to record statements of victims of operation blue bird (in Oinam district of NE region of India) with proper instruction of hon’ble high court, could not get success and was detained by Assam rifles. In another case, a civil magistrate of a lower court in another district got detained and was tortured by the Assam rifle personals. It is also known that Supreme Court in its finding, found in a case that two men got killed in a fake encounter but no case was registered against security personals as permission from central government was the first required condition. In the history of abuse of this law, many cases are buried. There are also thousands of untold stories which exists in the hearts of the innocent people and that are waiting to come out and to cry before the whole ‘civilization’. They want to shout out and inquire about the concepts of “civilization”, “justice”, “democracy” and “equality” that they were promised. In the aid of civil power, many armed operations have been done at the cost of the dignity and honor of people, in the aid of civil power, many civil authorities were ignored and overcame, in the aid of civil power many unlawful activities have been done. AFSPA is still a spot that reflects and caused the cry of civilians and that in no case required to exist in any civil area. It must be sure that no law should be above humanity and justice; no law should exist if it can permit unlawful or inhuman activities. It is unfortunate and shameful that the state of justice has closed her eyes. It is shameful that inhumanity is being proliferated in the name of aiding civil power.